Part of the success of Parque Das Aves is down to the amazing the staff they employ. The Environmental Education Coordinator for the park, Juliana Ebling, is also the President of the Brazilian Environmental Educators Association, and affiliated with the Government policy makers. My connection with Parque Das Aves goes all the way back to my school days. I didn’t know it then, but at 13 years old, I had an influence on the fortunes of what is now the largest bird park in Latin America. In 1995, two years into following his dream to set up a bird park in Brazil, Dennis Croukamp was looking for more investment. At the time, Dennis and his wife, Anna lived on the Isle of Man. As you might know already, or perhaps heard me mention in my Iguassu video, I’m also from the Isle of Man – that lovely little island in the Irish Sea, between England and Ireland. We left the story just after learning how much entrepreneur and founder Dennis Croukamp had risked in setting up a bird park in Latin America, and then sadly, he died. You can see Part I of this story here. Anna Croupkamp, who had been a housewife for sixteen years and had never run a business, moved to Brazil. She now says that if she had known about all the obstacles she would face, she would have been too terrified to do it. The odds have always been stacked heavily against the bird park – everyone from shady businessmen to government authorities have tried to close the bird park down at some point. Nature conservation in Brazil is not easy. Now, it’s the biggest bird park in Latin America, with over 500 000 visitors a year. With our profits we’re able to support a number of social and conservation projects in various parts of Brazil (supporting education, scientific research, reintroduction programs, organic agriculture and so on). As for social entrepreneurship, however, the Bird Park project has been about building a business that by nature produces socially positive results. There are the obvious benefits of giving Brazilians a positive experience of the natural environment by spending rare time in the Atlantic Rainforest and, in our walk-through, flee-fry aviaries that allow people closer contact with wild animals than you’ll find anywhere. We also educate 35 000 schoolchildren a year in a rapidly expanding environmental education program vital to an area and a culture where deforestation, trafficking and poaching are rampant. In addition, 47% of the birds in the park are animals rescued from traffickers and maltreatment. 43% have been bred here at the park, and we develop programs to reintroduce birds into the wild (many of these endangered species). Many of our staff, by the way, are former poachers and loggers, some of whom have now become expert bird handlers. Our staff love what they do with a passion. As Anna goes into retirement, the running of the park is passing over to her daughter, Carmel and son-in-law. There’s still a long road ahead and the sky’s the limit. “One of the most interesting concepts from the bird park story is that, when starting your own enterprise, it’s never possible to correctly assess all the risks or the possibility of success. I first met the Croukamps on the Isle of Man. Every year, hundreds of thousands of people visit their park, but how many of them know and understand what it took to get started? That is the story I would like them to share with you. 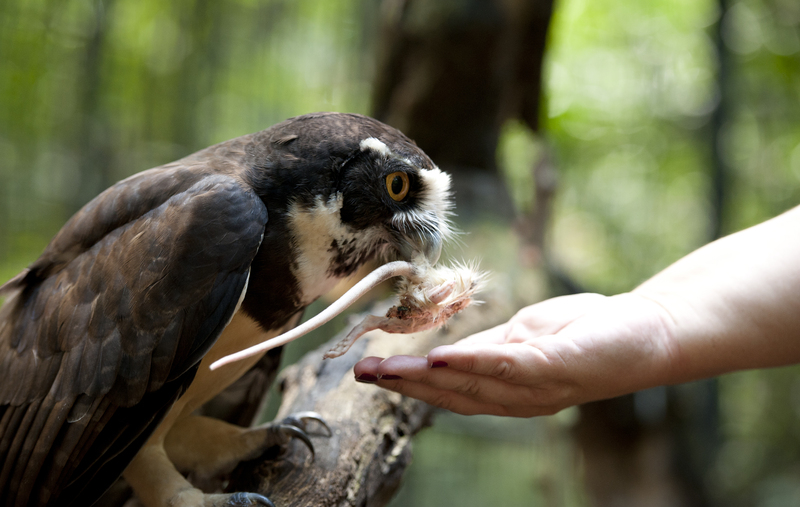 The Bird Park is a social and conservation enterprise in the endangered Atlantic Rainforest. We’re set right next to the Iguassu National Park, home of the magnificent Iguassu Falls. We make our money from tourism, charging entry fees for a unique experience of close contact with native birds in the jungle. This enables us to breed native and endangered species, conduct scientific research and educate locals on the environment. Parque das Aves Brazil was started by Dennis and Anna Croukamp in 1993. Dennis was an entrepreneur, Anna a vet. They both fell in love with parrots when a friend gave them a tiny, bald, ugly baby African Grey parrot, which they hand raised and which became a member of the family, flying free outside during the day, eating at the dinner table and going to sleep under a tea towel on Dennis’ lap every evening. Eventually, they had quite a collection of parrots. When they retired to the Isle of Man, Dennis got very bored. One day, a former manager of his came to visit and told Dennis of this place in Brazil with the most beautiful waterfalls, and that he thought they should build a crocodile farm there together. Dennis said, “I don’t like crocodiles, I like birds”. The idea was initially just to put together a project and to raise capital from larger investors. In those days, the Brazilian currency, the Cruzeiro, was still in hyperinflation, and the rule of law, actually only few years after the collapse of the dictatorship, was pretty sparse, especially in the notorious Triple Frontier (Brazil, Paraguay, Argentina) region. The Ernst and Young handbook on how to do business in Brazil said: “Don’t”. Almost inevitably, the investment deals fell through. Dennis lost his business partner, and he was left with the decision of losing all the capital he had put up so far, or of going all in and risking his entire retirement fund to finance it all himself. Dennis was passionate about this project. He decided to risk everything. He spoke no Portuguese, he knew nothing about building a zoo or of tourism, in a climate fundamentally uninviting to entrepreneurship. He poured all the money he had left into the park. Dennis and Anna sold their cars, jewelry, everything of value (Richard: In fact, my father bought Dennis Croukamp’s car). They started building. When they ran out of money, they opened the park to a small trickle of visitors. Then Dennis died.